Fin Tech - ExaWizards Inc.
We make financial services for people who have been left behind because of the digital divide. We develop new services to create a society where the elderly can live independently all their life. 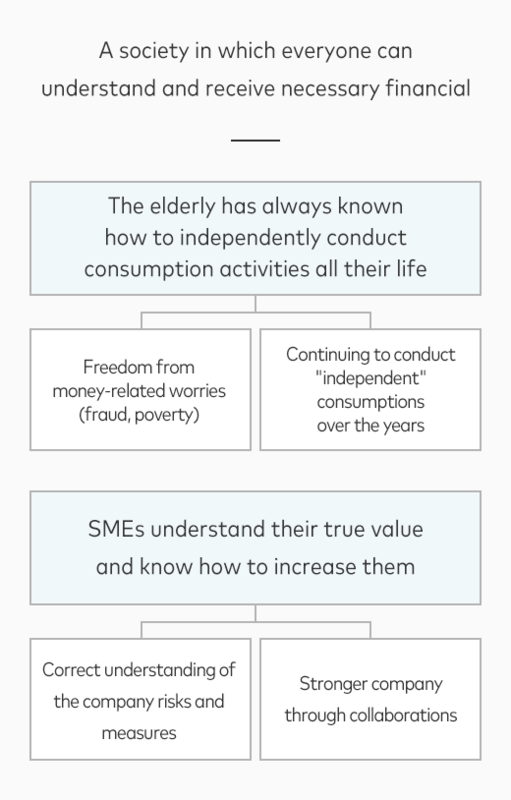 We aim to provide a system that protects the elderly from unintentional spending such as frauds and excessive purchases due to the decline in cognitive functions, as well as a system that allows them to lead an independent life and consumption activities even after cognitive functions start to decline. We develop new services that support the continuation and growth of SMEs. By improving the accessibility to their own company information with external viewpoints required for management, as well as to other companies’ information and financial services, we aim to provide a system that allows them to gain a better understanding of their company and take necessary measures. We develop innovative, more convenient financial services in collaboration with financial institutions. We are developing a new credit model and online finance-related products that are not bound by the traditional credit check model of financial institutions. By developing a new credit model, we aim to provide speedy, friction-less, better-quality services. We plan to develop innovative user experience not bound by the existing ideas in the financial industry as well as comprehensive products aimed at reducing social cost.